Open every Saturday 11am- 4p. Admission is FREE! Guests can enjoy the latest exhibitions in the galleries and view the artwork which lines the 15-floor staircase. A forty-five minute history presentation presents the colorful, well-known Baltimore figure, which is behind the iconic tower the clock and his famous headache remedy Bromo Seltzer. The Emerson Tower comes to life as we share humorous stories which highlight the forward thinking business and marketing strategies of Isaac Emerson. 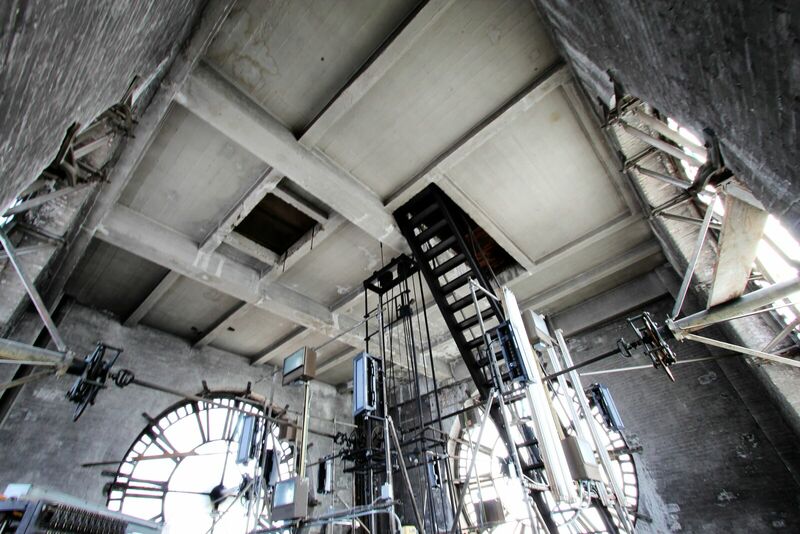 The presentation starts with a video and ends on a very high note as guests climb to the 16th floor via a “ships ladder”’ into the marvelous industrial mechanical room clock room, which houses the clock mechanism, the elevator switchboards and motors. Guests are encouraged to bring their cameras to capture the 24-foot clock dials as a backdrop. Visitors can also take in the recent reinstallation of the iconic clock by the Balzer Family Clock Works. Tours cost $8. Access into the clock room is by ships ladder which requires that each guest sign a liability waiver stating they are aware of the danger of climbing the ladder. Please arrive 10 minutes prior to the tour you wish to participate in. TOUR TIMES: 11:30AM, 12:30PM, 1:30PM and 2:30PM. Guests are encouraged to check out the history museum on the 15th floor and the artwork throughout the building before or after their tours. We ask that groups of 8 or more, when possible, schedule during the week. The building is accessible to the 15th floor by elevator. The clock is NOT handicapped accessible. Just fill out the reservation form, return it to us, and we’ll do the rest. We look forward to sharing our amazing tower. We are located 2 blocks from Camden Yards or the Hippodrome. Combine your show or game outing with a visit to the tower. METRO: Lexington Market stop. The tower is four blocks walking south on S. Eutaw Street. On the Street: There is limited metered street parking between Pratt & Eutaw and several blocks going north on Eutaw that cost $2 an hour for up to 4 hours during the day. Please be aware that during certain hours you cannot park on some streets in our neighborhood and you may be ticketed and towed. Please read the signs carefully. Street parking is free after 6pm. Landmark Parking Open lot directly across from the tower on S. Eutaw Street. Diagonally across from Up to 1hr-$7, 2hr-$9, up to 3hr-$11, up to 4hr-$16, Special Event $20. Closes 1 hr. after game ends. No Sundays. Holiday Inn open lot headed west on Lombard, on the left, before S. Eutaw. Arena Garage Howard St. and Lombard 1 block from the Bromo Tower walking west on Lombard up to 1hr-$8, up to 2hrs-$10, up to 3hrs-$14, up to 12hrs-$16. Events $20.